The 14TP is a little known Polish tank project of the late 1930s. While the information regarding it is vague and no photos have survived, some pieces of information about the project remain. The 14TP was based on the previous 10TP, but with more frontal armor, without the ability to run on its wheels alone and with a different engine. The Polnischer Panzerkampfwagen T-39 was first published by Janus Magnuski, a Polish historian, in his articles in the Nowa Technika Wojskowa 6/1996 and the Poligon 1/2009 magazines. 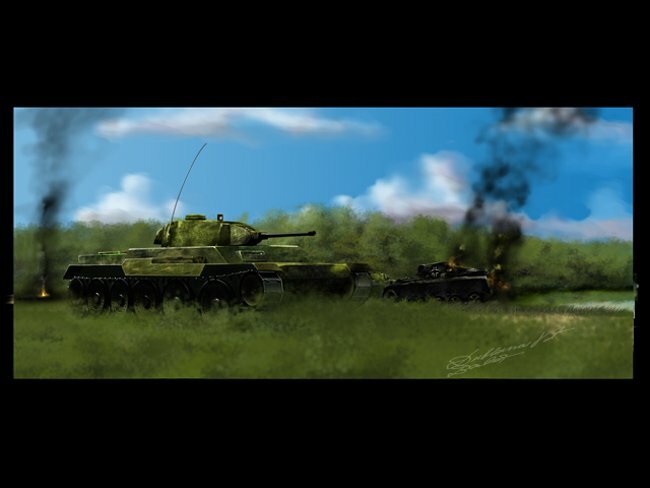 According to Magnuski, after the war, the sketch of a tank named the “Polnischer Panzerkampfwagen T-39” (“Polish Tank T-39”) was found in the documents of the Abwehr (Nazi German intelligence service). According to Magnuski, this tank looked like a cruiser-medium tank with a Christie-like suspension, similar to the 10TP, it was assumed that this was the German interpretation of the 14TP, based on whatever intelligence the Germans could get about it before or after the invasion. While this story is plausible, no evidence was offered to support it and the original document, if it existed, has not emerged. The Polnischer Panzerkampfwagen T-39 bears little resemblance to the 10TP, on which the real 14TP project was based. While it is often used to represent the 14TP, it most certainly bears no relationship to the real thing. Of course, intelligence services are not infallible, and it possible that the T-39 was based on very poor-quality information obtained by the German agents in Polish territory. Alternatively, it is also widely postulated that this was a deliberate fabrication deliberately planted by the Poles in order to fool the Germans. It is also possible that the Polnischer Panzerkampfwagen T-39 is a more recent fabrication, produced by Magnuski or supplied to him by somebody else. Until the original document will be found, it is hard to tell. The feature that brings the Polnischer Panzerkampfwagen T-39 closest to the 10TP and 14TP is its Christie-like suspension. The T-39 has five large rubberized road wheels on each side, which also supported the track return. In the case of the real vehicles, each wheel would have been connected to a large coil spring sandwiched between two layers of armor. ‘What-if’ illustration of the Polnischer Panzerkampfwagen T-39, presented as the real 14TP – Source: WW2 Drawings, illustrated by V.Bourguignon. 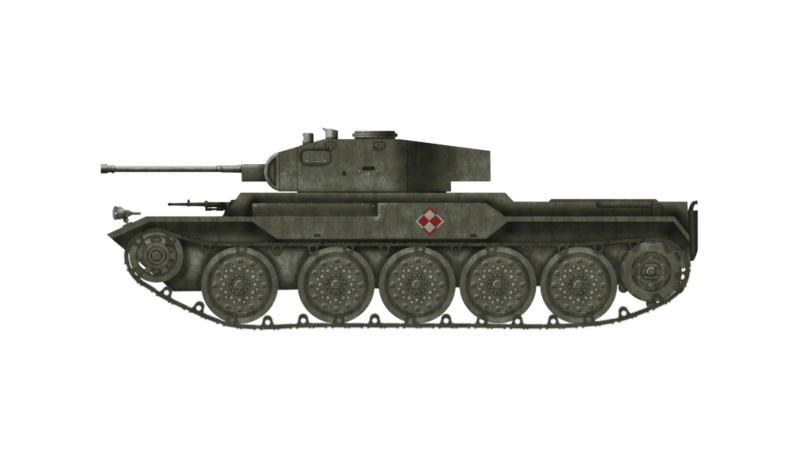 The Polnischer Panzerkampfwagen T-39, as shown in the outline from Magnuski, was significantly longer than the 10TP, with one more road wheel. Most of the lengthening seems to have gone to the engine bay. This partially relates to the real 14TP, which was meant to have a more powerful engine. The front part of the lower hull extends significantly in front of the superstructure, a feature that is common to frontal transmission vehicles. The rather large turret is mounted centrally in the vehicle, between the rear engine compartment and the front driver compartment. It does not resemble any Polish turret in use at that time. The front of the turret has a very pronounced curvature. It is noteworthy that the Polnischer Panzerkampfwagen T-39, as shown, does not have any machine-gun visible, either in the turret or in the hull. Illustration of the Polnischer Panzerkampfwagen T-39 by Jarosław Janas. Since the appearance of the Polnischer Panzerkampfwagen T-39 in the 1996 article by Magnuski, a document has appeared and widely circulated on the internet, often purported to be the original Abwehr document from which the T-39 project was ‘discovered’ by Magnuski. However, a careful look reveals several problems with this document. First off, it is extremely clean, both in its writing and in its preservation. While this does not necessarily mean it is fake, it is a warning sign. It must be noted that a large part of the original Abwehr documents was methodically destroyed during the war, to prevent their capture by the enemy. Furthermore, the German used in the document is full of grammar and phrasing mistakes. Whoever produced it was clearly not a native speaker, especially not one writing official intelligence documents! The drawing in the document also perfectly matches the T-39 drawing widely available on the internet. This might mean that Mister Januski was very thorough in reproducing it or that whoever produced this document used the image available online. Another interesting thing to note is that German documents did not feature drawings in them. The drawings were usually attached as annexes, and not present along with the text. The ‘Polnischer Panzerkampfwagen T-39’ is not the 14TP. However, it has become widely mistaken for the real 14TP. 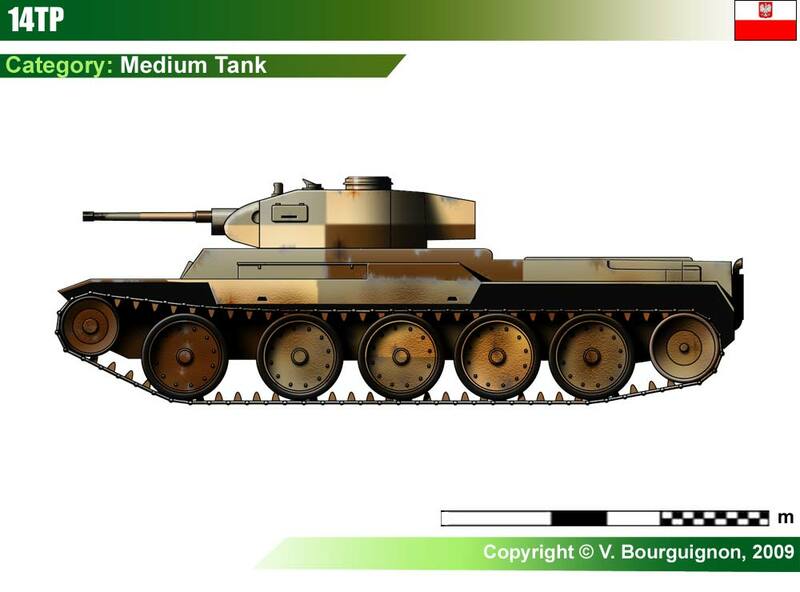 Many websites and magazines, when writing about the little-known 14TP, use this fake tank to illustrate their pieces, often omitting to make any distinction between the two. Also, some people have tried using the ‘Polnischer Panzerkampfwagen T-39’ to spin the 14TP into a far more advanced vehicle than it was, one that would be on par or superior to anything else of the time. New information, however, indicates it was not such a super-vehicle. 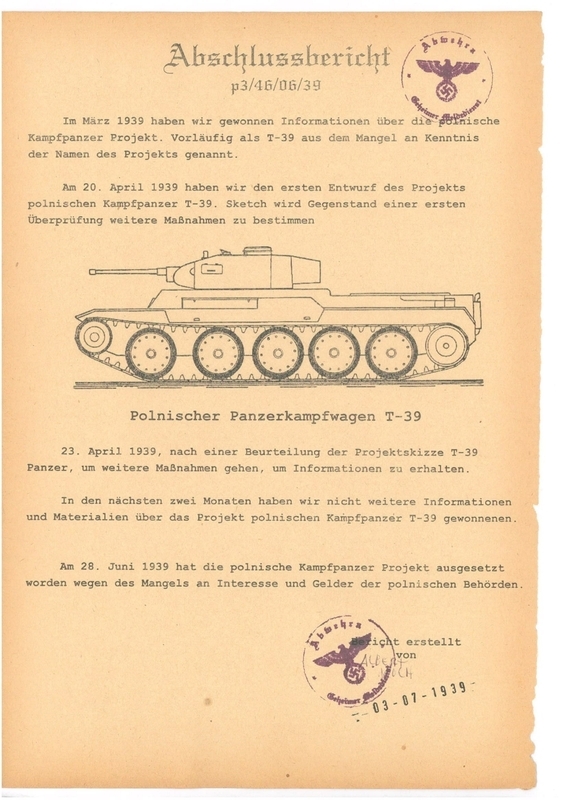 It is possible that Magnuski indeed saw the ‘Polnischer Panzerkampfwagen T-39’ in a German document, but until such a document appears, it should be treated with care. There is also no source where this ‘document’ was found or by whom or even when. And on what basis are you accusing of forgery Janusz Magnuskiu, conducted a scientific query, archival research or just base your knowledge on the forum information? The vehicle is almost certainly a fake. It bears no resemblance to the actual 14TP or any other Polish tank known at the moment. In the article, I have identified 4 points at which this fake might have taken place. The Germans might have been wrong, they might have been deliberately fooled by the Poles, Magnuski invented it or someone else invented it and gave it to Magnuski. If you have access to the document Magnuski found this in, I would be very glad to see it. Otherwise, I see no problem with our article. Also, all of my sources are listed at the bottom. First is the chance of have possession of an original intelligence document. Original documents of Abwehr activities are extremely rare it’s headquarters and outposts were systematically burned at the end of the war (John Byrden, “Fighting to Lose: How the German Secret Intelligence Service Helped the Allies to Win the War”, 2014). Copies were far more common, and obviously they are black and white and of very bad quality. In the assumption such document survived the archives burning, one must assume it was either it was stashed away or survived the flames. In the first scenario it would at least show signs of hasty handling, folds and creases. In the second scenario it would age faster, being exposed to acidic smoke. The acid environment discolor paper and make it brittle through oxidation, and this paper as never exposed to neither fire or extensive human touch. The darker shades of brown indicate the oxidation but they are perfectly symmetrical in every direction, indicating the paper texture was doctored by digital means. The foxing (the tiny darker spots) are acidic damage due to iron deposits. Paper produced in Germany in the 1930’s for office use would be more rich in dose marks by now. Furthermore, the letters in this typed document appear to be perfectly aligned and striking the typewriter tape with perfection every single time. such perfection seldom happened. Moreover, the signature is made in a style unlikely to be performed at the time, and even if not an signature, the name would be written in cursive. Further suspicion arises from the instrument used for the signature as it looks like pencil, which would be unacceptable for any document validity, or may be a faded ball point pen. Ball point pens were only available in Argentina in 1941 and licensed to the RAF during the war, being then anachronistic. The sketch itself is hard to justify by any reproduction methods of the type, taking into account this is the original document, and the style of the drawing in unlikely. And for last, the stamps seem nicely imperfect as if done by a real rubber stamp, but they have the same exactly imperfections and that is not how rubber stamps work, instead creating random small variations (look at the interruption of the circles specially (Joe Nickell, “Detecting Forgery: Forensic Investigation of Documents”, 1996). I hope that help put matters to rest. Thank you for your input Thiago! So I read your article and read articles from the late Janusz Magnuskigo (since 1999). Does Polnischer Panzerkampfwagen T-39 show 14TP? Certainly not, and therefore the question of what represents Polnischer Panzerkampfwagen T-39 that Horst Scheibert published a figure later in his article published in 1996 Magnuski. Reply can be traced to one of the reports Command Armored Weapons April 25, 1937. I could remove the Machine Gun and the Roundel if you like, it would be quite an easy thing to do. Thanks for the offer! We have added your illustration to our article. I hope the crediting is good for you. Also, you seem to be rather good at illustrating. We’d love to see more of your work if you’re interested in drawing more historical designs. Tell me if you would like to work with us! Hi, thanks for adding the illustration to the article. The crediting is fine. I would love to work with you in the future, but I am currently quite busy, maybe sometime next month I will have a bit more time to start illustrating again. When you want to, join our Discord server and send us a message on the recruitingstation channel. The German language in the German document is not authentic! What is “sketch” in a German document from the year 1939! This “German” is worse than anything I have ever read, completely fake. Probably the document is the reconstruction, which saw Magnuski. This document began to circulate on the internet long after the death of Magnuskigo. Did you thiago piwowarczyk see or read an article posted Magnuski in 1996. In “Nowej Technice Wojskowej” (NTW)” and developed by Kinsky article “Poligonu” from 2009? Probably not, since you are trying to analyze the unknown origin of the “document” posted by TE and who did not appear in any article Magnuski. The “german”- Abwehr document is really “World of Tanks”- level of fake! No document header. No name written with type-writer under the signature. Bad and broken german. The “official” stamp has “Abwehrn” instead of “Abwehr”. The word scetch is used instead of Skizze. One of the lowest effort fakes I’ve ever seen!